New UFC interim welterweight champion Colby Covington will put down the gloves and pick up the cards to play in the World Series of Poker in July. 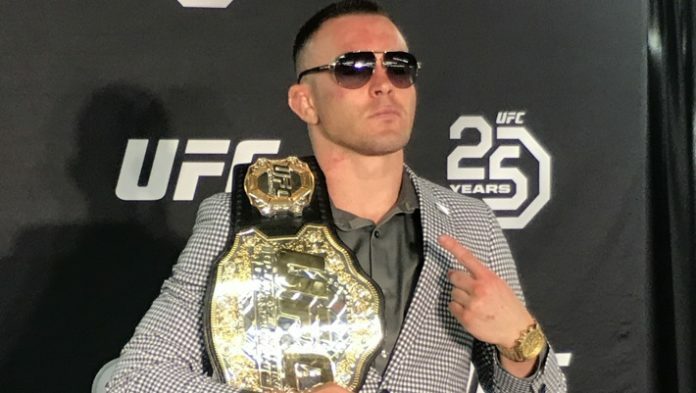 Fresh off a win over Rafael dos Anjos at UFC 225, new interim welterweight champion Colby Covington is putting down the gloves and picking up the cards for a huge poker tournament in July. Covington revealed on Monday that he will take part in the upcoming World Series of Poker main event that takes place from July 2-14 in Las Vegas with the winner of the event taking home more than $8 million. The new interim champion plans on getting right back into the gym following his win but he’s going to take a brief detour for the World Series of Poker. While the World Series of Poker will take place over two weeks, Covington says that’s about the only break he has planned before preparing for his title unification bout against welterweight champion Tyron Woodley later this year. Covington has said he hopes to face Woodley in November as part of the UFC’s return to Madison Square Garden in New York and he’s not going to waste any time starting his training camp for that highly anticipated matchup. “I love this lifestyle. I live this lifestyle. I live this 365, there’s no off days. I’m not injured, nothing’s hurt, so I’m right back to training,” Covington said. “I’m going to Vegas for two weeks and play the World Series of Poker Main Event and that’s in the early part of July and then I’m going to go on my little promotional tour that the UFC’s going to send me on and then I’m going to go visit Trump at the White House. Who wins in the title fight between Colby Covington and Tyron Woodley? Sound off in the comments section and let us know!